Venice is the land of canals, Rennaisance grandeur, and—these days—decaying buildings. It’s as if Disney built a theme park on the glories of power in the 1500’s, and then left it to slowly crumble. All the employees are still on the payroll and you can ride around in boats, but the maintenance crews have been off smoking cigs for the past 300 years. But we digress from the nachos sitting gloriously before us. YES, there are nachos in Venice if you consider sitting in a Hard Rock Cafe off San Marco Square being in Venice. It’s a bit like visiting a McD’s while touring Tibet. We felt guilty forgoing more traditional Italian cuisine for the evening. And yet, duty calls. Couldn’t amazing Italian nachos be possible? We’re thinking something simple and elegant: fresh melted mozzarella, juicy chopped tomatoes, and plenty of olives. Alas, those were not the nachos are Hard Rock. Instead, we got a plate of truly American nachos, right down to the imported cheese. Words such as “adequate,” “enjoyable” and “boring” come to mind. Appearance (7): At first glance, these nachos exceeded expectations. There appeared to be an abundance of cheese, ample guacamole and fresh veggies. The portion size was also quite substantial for Europe. Quality of Ingredients (6): The ingredients were remarkably American, and probably all imported from the USA. (Might explain the rather outlandish cost!) Apparently, the cheese in Italy just isn’t good enough for Hard Rock. Fresh and flavorful is so not cool, so they use medium cheddar and monterey jack that were probably pre-shredded at the factory. The chips were corn, and slightly greasy but not stale. There were pinto beans and jalapenos, also from cans. The highlight was the guacamole and salsa we ordered for an extra 2 Euros. We didn’t see avocados for sale in the local markets, and were surprised how good they were. Imports or not, the guacamole was fantastic. Distribution (7): We were pleasantly surprised again. The pinto beans were on the bottom layer. Cheese, sour cream, tomatoes and jalapenos covered the top. We had a good balance between the chips and toppings. As we dug in, the cheese began to cool down and some of the chips became soggy. However, that may have been more related to our leisurely eating than design faults. 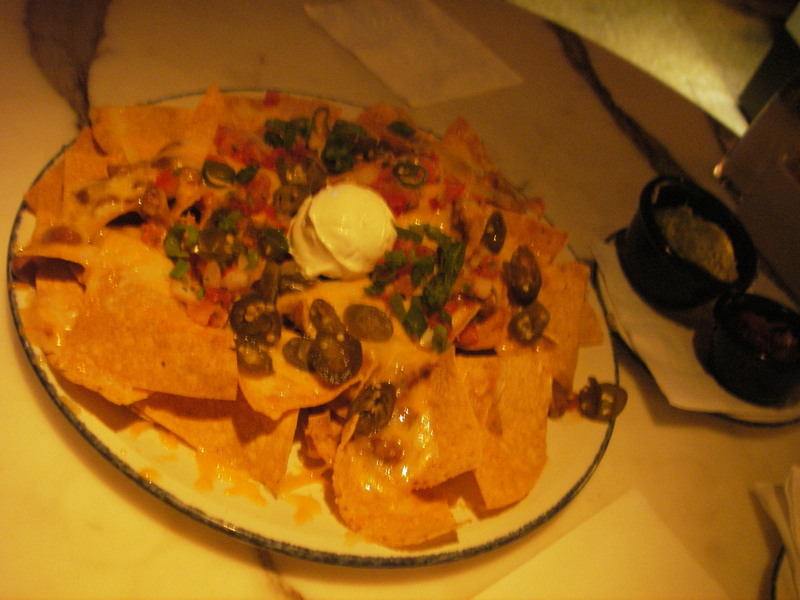 Overall (24): No one will be singing arias over these nachos, but they are definitely adequate for patrolers needing a reassuring fix in a faraway place. We’re holding out for some true Italian nachos. If they’re out there, we’ll find them. Hopefully before global warming puts Venice and much of the surrounding area under water.